Berlinica Publishing LLC, 9781935902959, 176pp. 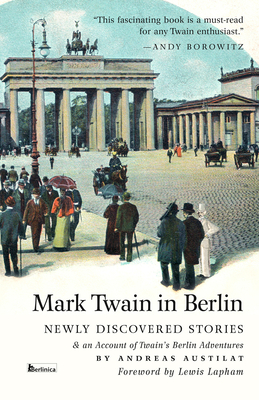 Assembled for the first time, this collection includes stories penned by Mark Twain about his everyday life, the beginnings of a novel about the lonely Prussian Princess Wilhelmina von Preussen, and his travels in Berlin which began in the fall of 1891. Twain, a “Yankee from head to toe,” according to the Berlin press, conspired with diplomats, frequented the famed salons, had breakfast with duchesses, and dined with the emperor. He picked a fight with the police, was abused by a porter, got lost on streetcars, was nearly struck down by pneumonia, and witnessed a proletarian uprising right in front of his hotel on Unter den Linden. This previously unpublished collection is now available for the first time in the U.S.
Andreas Austilat is the deputy editor of the Sunday supplement of "Der Tagesspiegel," Berlin s leading daily, where he has worked since 1987. He has interviewed many celebrities, documented conversation with the last survivors of the Hindenburg, and discovered the lost copies of the oldest existing Titanic movie hidden in a Berlin archive. He has published three travel and culture guides about Brandenburg and a history book about Zehlendorf, an affluent Berlin suburb. He lives in Berlin. Lewis H. Lapham is the founder of Lapham s Quarterly and the former editor of Harper s Magazine. His writing has been published in publications such as "Life," "Forbes," "The New York Times," "Vanity Fair," and "The Wall Street Journal." He is the host and author of the PBS series, "America s Century." He is also on the Board of Trustees of the Advisory Council of the Mark Twain House in Hartford, Connecticut. He lives in New York City."